Kokomo, Ind. – Indiana University Kokomo men's basketball team got their first home victory of the season against Purdue University North Central (PNC). The Cougars topped the Panthers, 81-76, in front of a large Homecoming crowd Saturday. Nathaniel Carroll (32) sweeps around Purdue University North Central for another point. See more photos here. "The team played really well tonight," said Head Coach Jace Thompson. "Everyone bought into being a good teammate and committing to our stuff. We had excellent efforts from the role players and they were the ones that made this a win. "The atmosphere was special tonight. We had a great student section and the parents and community members made it a great college atmosphere. We are lucky to live in a basketball community that supports us," Thompson added. PNC opened the game with a three-point basket, but Carroll answered with a three for the Cougars to tie it up. The Panthers would push their lead to eight with less than 16 minutes left to go in the first half, courtesy of back-to-back baskets. After the one-minute media timeout, Campbell would get fouled and head to the line to convert the three-point play to pull the Cougars within three. With about seven minutes left in the first half, IU Kokomo would tie it up at 25-all off a Campbell three point basket and take a one point lead when Northington knocked down two free-throws. PNC went on a 5-0 run to take back the lead, 31-27. With five minutes to play in the first half, Renbarger cut the lead to one with a basket. The Cougars would tie it up at 34 all after Jalen Tinder scored with less than four minutes left before the half. The Cougars were unable to move off 34 and PNC would go on a 7-0 run until Krhin and Lawrence would combine for three free throws to get the Cougars back within four. Lawrence ended the second half with a basket to cut the lead to four (39-43) heading into the locker room. Renbarger opened the second half with a basket to cut the lead to two, but a steal by PNC extended their lead back to four (41-45). A basket by Lawerence off a Carroll pass brought the Cougars within one point. The Cougars took the lead after Carroll knocked down a 3-point basket with less than 17 minutes left in the game. Northington hit back-to-back baskets to extend the lead to six with under 15 minutes. PNC cut the lead to one with under six minutes left in the game until Carroll knocked down two free throws to push the Cougar lead to three. The Panthers would fight back to cut the lead to two with less than three minutes to play. Back-to-back baskets by Renbarger pushed the margin to 6 (76-70). With only two minutes left in the game, PNC was unable to cut into the lead and the Cougars cruised to a 81-76 victory. The Cougars were able to shake off the poor shooting performance from Tuesday to improve to 40 percent (27-of-66) from the floor and 25 percent (7-of-28) from behind the arc for the game. The Panthers shot 40 percent (26-of-64) from the field and 19 percent (4-of-21) from the three-point line for the game. The Panthers were unable to connect from the three-point line in the second half, going 0-10, while the Cougars knocked down three from long range. Joby Renbarger finished the game with his second double-double of the season with 15 points and 10 rebounds. Reomey Northington had a team high 17 points and Nathaniel Carroll was the third Cougar in double figure scoring with 15. David Kelly led all scores for the PNC Panthers with 19. The Cougars (4-6) continue their home stretch hosting Indiana University Northwest Saturday (December 15) at Kokomo High School Gymnasium (Entrance 13). Kokomo High School is located on 2501 South Berkley Road in Kokomo. Tip-off is set for 3 PM against the RedHawks. Live video is available online at http://kokomoperspective.com/video/ or for up-to-the-minute updates, follow Cougar Basketball on Twitter at @IUKBasketball. 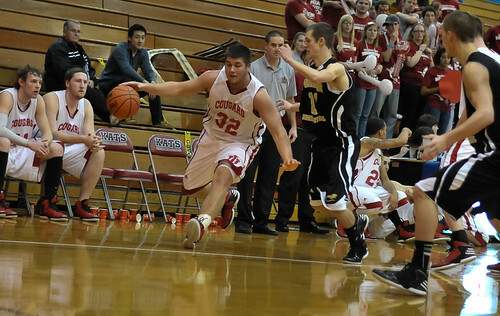 You can also find the Cougars on Facebook (/IUKBasketball).